The new guy is back. The much anticipated 2016 Nissan Titan is a true full-size truck that has it all. Power, reliability, strength, and the daring poise that shouts we are different and for good reason. If you are keen on stepping away from the norm and demand equipment that checks all the boxes, than this truck is for you. Your new Titan will definitely stand out on the road, and a new T-Rex Grille will help you stand out with style and attitude. 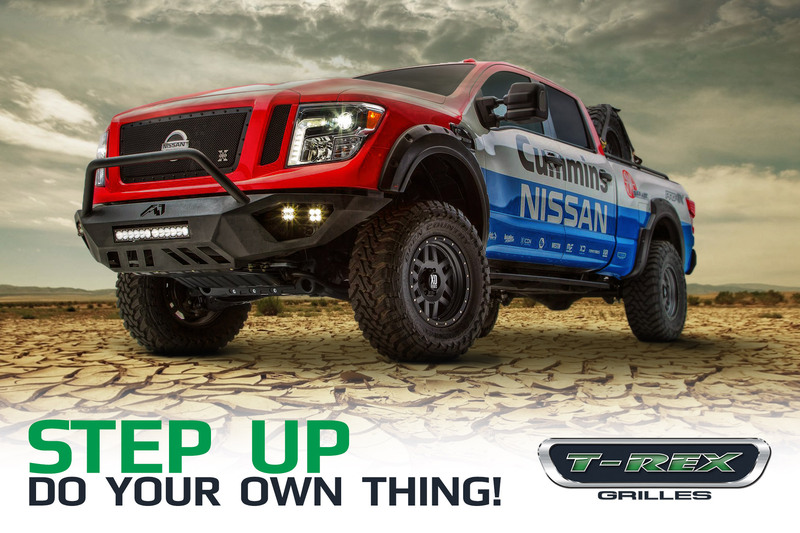 T-Rex Grilles has designed four different grille types that totally transform the appearance of the new Titan. Each Main Grille is built as a three piece insert and there is an optional complimenting bumper grille overlay to complete the look. If you’re the type that swims upstream, and not afraid to stand apart from the crowd than this truck is for you. Just in case you don’t want to get caught looking older than you are, why not upgrade your new truck with a new T-Rex Grille and stand out with attitude.